Growing sugar snap peas is a delicious way to enjoy gardening. Sugar snap peas are a real treat when eaten raw. They have a sweet mild taste that will please almost everyone. Because you eat the whole pod, you can just pick and eat. Even though they have the word “sugar” in their name, they contain only 2.52 g of natural sugar per cup. There is a mere 67 calories in sugar snap peas per cup. A cup of sugar snap peas contains 4.6 mg per cup of lutein, an antioxidant that is important to skin and eye health. A cup contains as much vitamin c as a medium orange. 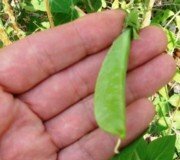 Growing sugar snap peas can be very healthy! I try to plant around Valentines day (February 14). The peas mature in about 2 months. This gives me about a month of harvest time before they falter under the hot June sun. In milder climates, they can be grown in the fall as well. I have read that peas don’t transplant well. However, when it’s time to sow the seeds, the soil in my garden is too cold for them to germinate. So when growing sugar snap peas I start mine in cell packs with a heat source. They germinate well at 65 to 70 degrees soil temperature. I am careful not to leave them in the pot too long, since they are vining plants and get tangled together. They must be handled carefully so as not to disturb the roots too much when they are taken out of the cell pack for transplanting. Sugar snap peas are considered the best tasting snap variety of pea. They are different from snow peas, which are harvested while still flat. Sugar snap peas are best harvested when the pods are round and plump. There is a newer variety called super sugar snap peas. These may be planted a little earlier and are more resistant to powdery mildew. However, they are not quite as sweet. 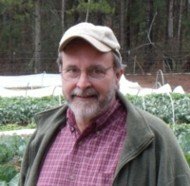 The variety Sugar Ann snap pea may be planted the earliest of the snap peas. It can be grown without support. However, the pods have strings that need to be removed before cooking. Sugar snap peas need full sun. Their roots reach deep into the soil, so make accommodation for this. They can be directly sown in the garden or carefully transplanted, as outlined above. 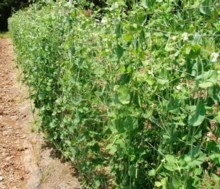 Sugar snap peas require trellising to support them. They can grow 6 foot tall. I plant them about 3’’ apart in the row, and space the rows about 28’’ from each other. Peas belong to a group of plants called legumes. This group of plants use bacteria to fix nitrogen into the soil. Since peas can make their own nitrogen, only a small amount of organic fertilizer is needed. To supply important trace minerals, I add some Ocean Trace to the water when I water the plants. Sea minerals are loaded with trace minerals. These make my peas so much more nutritious and beneficial, plus they enhance the flavor! 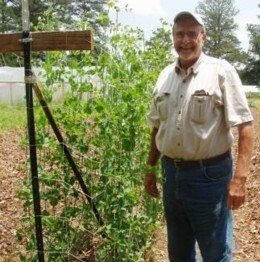 Sugar snap peas do best when the soil is kept slightly moist, not dry and not water logged. A moist soil is especially important when they start producing pods. Every few days I examine my peas, looking for any vines that are not attached to the trellis. If I find any, I carefully help them to hook into the trellis. Once the peas are round and plump I pick them. Picking them often stimulates the plant to bear more. If peas are left unpicked they become tough. Sometimes a powdery mildew appears. If this happens, you can purchase an organic control called Serenade. It is a biofungicide that kills the mildew. Pick peas when they are round and plump. Sometimes they can be hard to spot. I look at my vines from various vantage points to try and find most of my peas. I especially enjoy just popping these delectable morsels into my mouth right out of the garden. If you have an abundant crop, peas can be frozen and used later in a stir fry. Preheat oven to 450 degrees F. Place sugar snap peas on a baking sheet in a single layer, not piled up. Brush with olive oil and top with the other ingredients. Bake 6 to 8 minutes. They should be tender but still have a little crunch.